Who said authoritarian despots can’t throw a party? 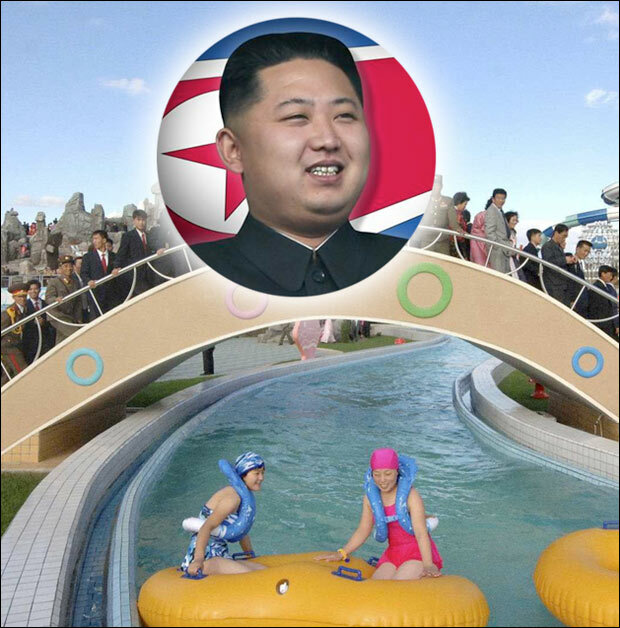 North Korea, not exactly known as a vacation destination, has opened a water park to improve its seriously dismal image. The Munsu Water Park, located east of the capital of Pyongyang, recently hosted an ostentatious opening. See photos here. Of course, the average citizen will not be able to afford the fun of a water slide. “The standard of living has deteriorated to extreme levels of deprivation in which the right to food security, health and other minimum needs for human survival are denied,” notes a report issued by the Korea Institute for National Unification, a research group based in Seoul. The annual GDP per capita is about $1,800, which ranks 197th in the world. Around half of North Korea’s 24 million people live in “extreme poverty” and exist on corn and kimchi, a fermented vegetable dish. But then Munsu is undoubtedly not for the average North Korean zek. It’s for the inner and some outer party members of the government that likes to pretend it is communist. At the top of the stinking heap that is North Korea sits dictator Kim Jong-un who, according to his buddy Dennis Rodman, the former basketball star, enjoys a “seven-star” lifestyle of yachts, parties and extravagant food. “It’s like going to Hawaii or Ibiza, but he’s the only one that lives there. “He likes people to be happy around him. “He’s got 50 to 60 around him all the time — just normal people, drinking cocktails and laughing the whole time.